I noticed a headline on my internet home page today reporting a "modest but steady economic recovery." The report is mixed, of course, with sectors of the economy still stuck in neutral--or even heading in reverse. Your firm's core markets may be among those. But even if business is on the upswing, your firm may still be experiencing some hangover effects from the worst of the recession. If you laid off staff, and especially if the uncertainty persists, you may have a lingering trust deficit. Layoffs have a tendency of eroding trust between management and staff even in the best of workplaces. The problem is perhaps magnified by the underlying causes of this recession, which have raised general distrust of corporate governance to new levels in the U.S. Layoffs also create higher stress levels. Fear of losing one's job and uncertainty about the company's future prospects certainly increase stress. So does taking on added responsibilities left by those who were let go. With many firms still cautious about hiring even though workload has picked up, longer hours may be contributing still further to the tension. Some stress in the workplace can be productive, specifically the stress of challenging work, high standards, and pressing deadlines. 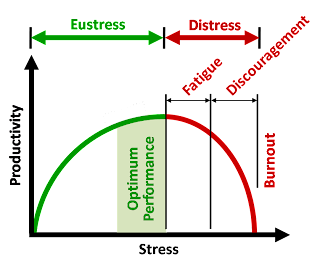 This positive stress, called eustress, can help workers achieve optimum levels of performance. But negative stress works against productivity. It may be masked by busyness, but output per unit of effort begins to drop when the stress of distrust, uncertainty, unrelenting pressure, and other factors start to wear on workers. Undoubtedly negative stress has been elevated by the recession. And at a time when you need optimum output in a still tough economy, this stress may be hampering your firm's efforts to recover. So what can you do to alleviate the level of negative stress in your office or department? Obviously, the general strategies for creating a better workplace help offset these stress-inducing factors. You can refer to previous posts for insight on several of these. But let me focus here on something else you can do to quickly rebuild trust and relieve the anxiety. This is a lesson I learned several years ago when I got involved in risk communication and community relations associated with controversial environmental cleanup projects. Similarly, residents near these sites harbored distrust and anxiety due to the perceived risks from toxins in their soil and groundwater. Risk assessment experts were often brought in to examine exposure pathways and create statistical models to show that the actual risks were not a significant health concern. But residents typically remained unconvinced. As I explored their response further, I discovered the real cause of their angst. It wasn't so much a matter of risk or uncertainty; it was an issue of control. You see, people voluntarily assume certain risks everyday. Some--like driving a car--may pose a far greater threat to life and health than the potential exposures to hazardous materials at many of these sites. But the difference is those individuals chose to assume the risk of driving, but not the risk from contaminants. The best strategy for alleviating much of their concern, I learned, was to give them some sense of control. Engage them in the process. I found that involving residents in planning for reuse of contaminated sites was particularly effective. It shifted focus from the negative to the positive. It also helped rebuild trust. So what has this to do with curing the post-recession blues in your firm? I think many employees are in much the same place emotionally as those hazardous waste site neighbors. They are faced with new fears and stresses, and what is particularly unsettling is the feeling that there's not much they can do about it. I've heard several say in recent months that they're just waiting for "the other shoe to drop" (or something similar). The best way to counter such feelings in my experience is to actively engage employees in working on solutions to the problems the company faces. Need more business? Spread participation in the business development process across the organization. There's something that people at every level can contribute (see this post). Facing increased pricing pressure? Invite staff to help identify opportunities to make your work processes more efficient. Most employees would rather be fighting the battle than wondering if they'll end up as collateral damage. Invite them to be part of your firm's recovery efforts. Not only will that help rebuild trust and alleviate negative stress; but you'll end up with better solutions than management is likely to come up with on its own. And a larger team committed to making it happen.